Buy online MAS830L Digital Multimeter in India at low cost from DNA Technology, Nashik. Digital multi-meters are widely used for measuring voltage, current, resistance and IC in electronic circuits. The device has a DC & AC voltage of 600 V and can make up to 1999 counts. It has a dimension of 138 x 69 x 31 mm and an LCD display measuring 15 mm. 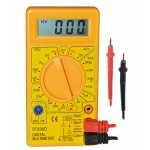 The multi-meter has a DC current range of 10 A. 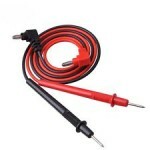 It has an AC current accuracy of Ã‚Â± 1.2 % and a DC current accuracy of Ã‚Â± 0.8 %. In this multi-meter there is inbuilt IC checker. The multi-meter has been quality tested by industry based experts; it is best suited for making continuity tests. A highly portable device -The digital multimeter is compact and pocket sized and therefore can be carried from one place to another. An ideal tool for people who are always on the move - It is best suited for usage by professionals who are always on the move for taking basic measurements. 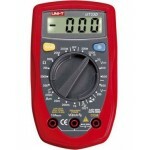 A versatile product - The digital multimeter is efficient in making diode checks up to 3V/0.8 mA. It can also be used for holding data. The device comes with a back light.